This certainly isn’t your mother’s banana bread, but mama dearest will be begging you for the recipe soon enough! Pina colada banana bread is a tropical indulgence. Studded with pineapple, coconut, and a hint of rum, it has all your favorite pina colada flavors. Today’s post has been sponsored by Bob’s Red Mill, but the opinions expressed are all my own. Do you have friends who flood your Facebook and Instagram feed with tropical vacation pictures during spring break? I do. And to be honest, it makes me really stinkin’ jealous. Like, I like their pictures, but I’d also like them stop with the pictures, know what I mean? They’re off sippin’ drinks out of coconuts on the beach in Jamaica and I’m slogging through cold rain puddles on my way to work. This time though, it worked out in my favor, because I was inspired to make this tropical pina colada banana bread. This bread is sunny, sweet and oh so indulgent. The foundation of any bread recipe is the flour and I’ve used Bob’s Red Mill Organic Unbleached White Flour. This flour is made with organic hard red wheat…period. There are no additives. It’s the same high protein flour as used by professional bakers and is perfect for every baked good from breads to cakes to cookies and more. One of the things that I love about this pina colada banana bread is even though it tastes exotic, it’s not an expensive recipe to make. 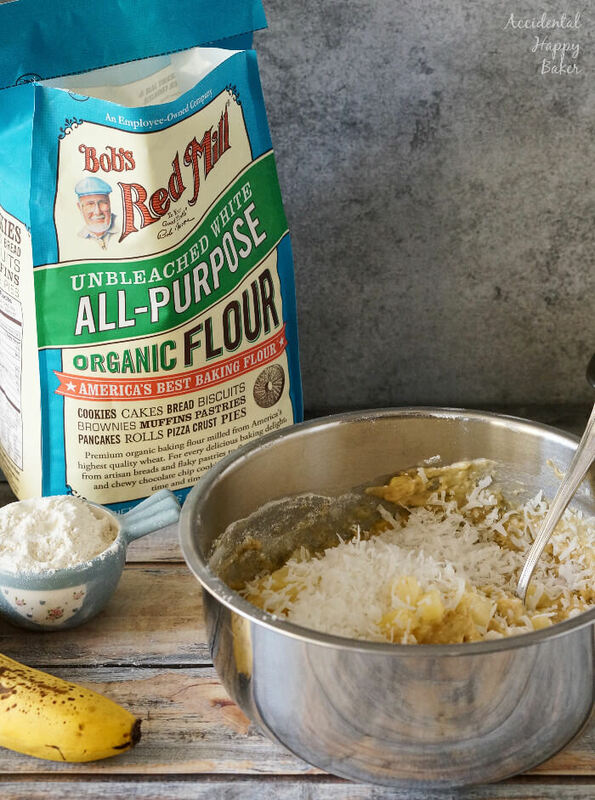 Here are a few tips and tricks I’ve found when making this pina colada banana bread. If you don’t have time to wait for bananas to ripen, simply roast your bananas on a baking sheet in a 250 degree oven for about 10-15 minutes until dark brown. Let cool before using. We don’t want the banana to disappear once the pineapple and coconut are added, so a rough mash will do it. The bananas don’t have to be finely mashed. Leave a tablespoon or so of pineapple to sprinkle over the dough before baking. This not only looks pretty, but also ensures a proportionate amount of pineapple throughout the loaf. And lastly, spooning the glaze over the loaf while the bread is still warm ensures that the glaze will melt into the bread, while waiting till the bread has cooled to glaze results in a more frosted banana bread. 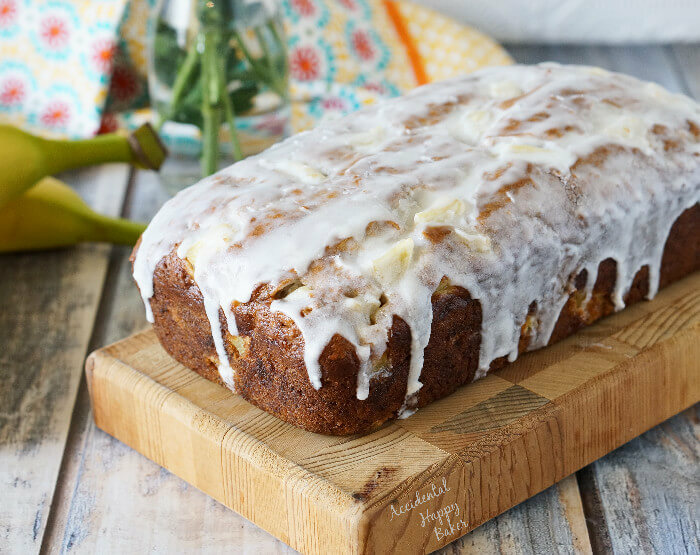 Pina colada banana bread is a tropical indulgence. Studded with pineapple, coconut, and a hint of rum, it has all your favorite pina colada flavors. Preheat the oven to 350 degrees and prepare a 8 x 4 inch loaf pan with nonstick baking spray. In a medium sized mixing bowl, roughly mash the bananas. Add the egg, brown sugar, granulated sugar, vanilla, and rum flavoring. Blend together until well combined. Add the melted butter and mix again. Add the flour, baking soda, and baking powder to the wet ingredients, stirring until just combined. Drain the canned pineapple, reserving the juice for later use. Add all but one Tablespoon of the pineapple to the mixture, along with the shredded coconut. Blend the fruit into the dough and pour into the greased loaf pan. Sprinkle the remaining Tablespoon of pineapple over the top. Bake at 350 degrees for 50-55 minutes or until golden brown and a tooth pick inserted 1.5 inches from the side comes out clean. Remove to a wire rack and allow to cool for 10 minutes in the pan. In a small bowl, combine the powdered sugar, butter, rum flavoring and reserved pineapple juice until the mixture becomes glaze consistency, adding more pineapple juice if necessary. Turn the banana bread out of the pan and pour the glaze over the top of the bread. Store in an air tight containter. 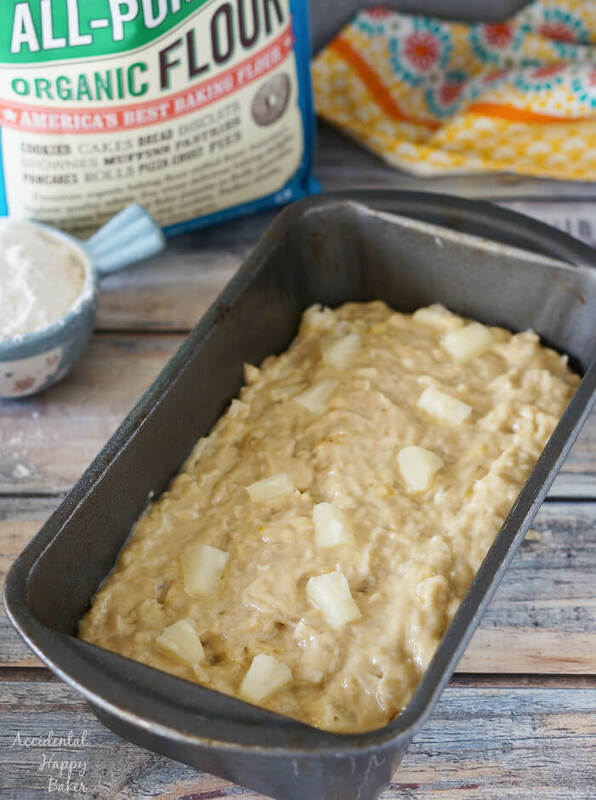 I love the flavor of pina colada anything, but never thought to use it in banana bread! I make a pina colada smoothie with banana, so I know I’d go nuts for this. Thanks for sharing! Oh my word! This sounds absolutely yummy! And I never knew you could ripen bananas like that – great information to have. Thanks!! Thanks Kathie, you’re going to love this bread! It’s so yummy. I could eat the glaze with a spoon. The flavours is this bread has me swooning! I cannot wait to bake and taste it for myself! Who needs a real vacation with a loaf like this in the kitchen! I use Bob’s red mill products all the time! 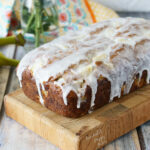 This banana bread looks delicious, especially when drizzled with that luscious glaze!! Yum. Oh, I just love banana bread, but this version looks extra special. The tip about ripening bananas is super helpful! Thanks Christine. Sometimes my kids can’t leave the bananas alone long enough for them to get ripe so I can bake. This trick lets me make whatever banana baked goods I want whenever I want! 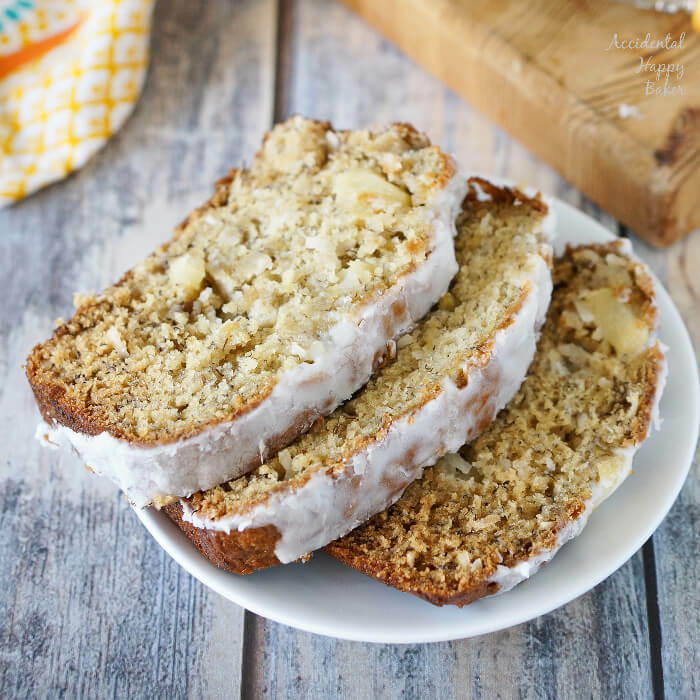 This sounds like my kind of banana bread, and it sounds so perfect for Spring/Summer time, too! Yes, it will be perfect for Mother’s Day brunches too. You know, start mom’s day off right with a little rum. Haha.